Pest description and crop damage Large, bright-green bugs, shield-shaped and flattened. They have a foul odor and may contaminate berries at harvest. The machine harvester can shake insects from the plants, potentially contaminating berries going into the harvest trays. Correct adjustment of air-blast or vacuum-suction cleaner systems on mechanical harvesters can lessen insect contamination of machine-picked berries. No insecticides are registered specifically for this pest. 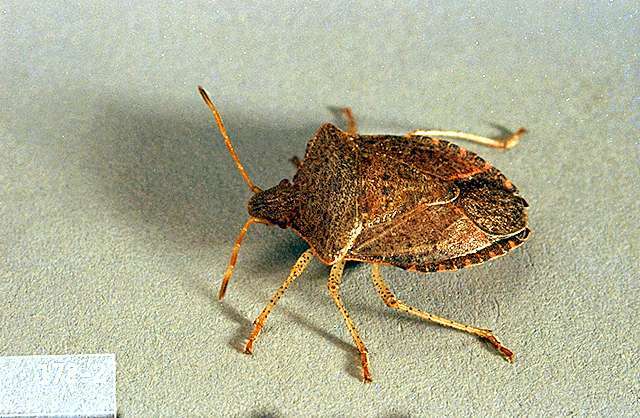 Products applied for leafroller control before harvest (such as: bifenthrin, esfenvalerate, fenpropathrin, malathion, and zeta-cypermethrin) may provide some control of stink bugs.